Angel BEE is an all-in-one investment app, providing a one-stop solution for all your mutual fund investment needs. The Angel Bee mutual fund app was awarded “Best Mobile App for Mutual Fund Investments of the year” at India BSE – CEO Weekend 2018, organised by Tefla. Why should you invest with Angel BEE investment app? All recommendations by the Angel BEE mutual fund app are backed by ARQ – our hyper-intelligent investment engine which picks out the best funds across Equity Schemes, Debt Schemes, Balanced Schemes and ELSS Schemes. ARQ-recommended schemes have consistently beaten the benchmark and top five schemes (by AUM), back-tested over the past seven years. What can you do with Angel BEE investment app? Define your financial goals and plan your investments to achieve your dreams. Use ARQ to analyze the SIP amount required to achieve your goal. Monitor your external mutual fund investments along with the investments made via Angel BEE through the Angel BEE mutual fund tracker. Just upload your consolidated CAMS statement to manage your mutual fund holdings in one place. The investment app gives you access to a Big Savings Account that will allow you to make better returns on the money lying idle in your existing bank account. Withdraw money, anytime, anywhere, 24*7 using the Angel BEE app. Saving tax has never been this easy. 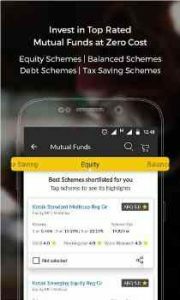 Invest in the best tax saving schemes (ELSS mutual funds) without any paperwork through the innovative mutual fund app. Set budgets, analyze your spends and smartly manage your money with the Angel BEE investment app. The app automatically processes your transactional SMSs and classifies your expenses into categories like food, shopping, travel etc. Which funds can you invest in with Angel BEE mutual funds mobile app? Are there any charges to avail these services? Angel BEE does not charge any money from its customers for using the investment app. We earn from the commission we get from the mutual fund asset management companies. Mutual funds, like securities investments, are subject to market and other risks and there can be no assurance that the objective of any of the schemes of the fund will be achieved. Please read the offer documents carefully in its entirety prior making an investment decision. What are you waiting for? Download the Angel BEE investment app and transform how you invest and manage money! Dear Mr Rawat, We deeply regret the Inconvenience caused to you. To keep you updated, we have resolved the Technical Glitch. Kindly install the Latest Version of “AngelBee” to enjoy uninterrupted Investments options. Kindly revert in case of further concerns at support[at]angelbee.in or Call us at 022 44443333. Best Regards-ANGELBEE Support. For new user sign up, need step by step guidance. Most of the time, new user who is registering for first time using AngelBEE is not able to figure out what to do next to complete registration process. App should take to next step on its own till registration completes. Srarting SIP took 5 mins. no hassles. Hi Raikishori! Thank you for your 5 star rating. Happy investing. Team Angel BEE. Hi Dinesh! We appreciate your positive feedback. Thank you for choosing Angel BEE as your investment platform. Happy investing. Team Angel BEE. Great app to invest and have track of it. User friendly. Hi Harshil! Thank you for your positive feedback. Happy investing. Team Angel BEE.